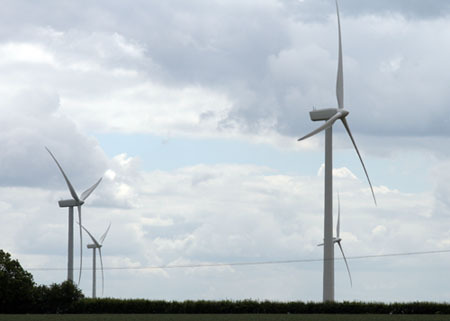 Second Windfarm Proposal near Sulgrave – Parish Council Meeting 18th February. A map was shown indicating the proposed location of the six turbines in relation to the nine already proposed by Enertrag Limited between Sulgrave and Weston which would be of a similar height. Broadview have submitted a scoping request to South Northamptonsire Council, the local planning authority, dealing with the matters to be investigated as part of the Environmental Impact Assessment which applicants are required to carry out for developments of this type. An application has also been made for permission to erect a 60 metre high meteorological mast with the aim of assessing average wind strengths and directions. The company had also held a meeting to present the proposals to the representatives of the affected Parish Councils, namely: Greatworth, Helmdon, Marston-St-Lawrence and Sulgrave. At this meeting it was suggested that the company would be in a position to submit a planning application by June of this year. Having thus given details of the proposal the Chairman opened the meeting up for a general discussion between councillors and members of the public. One of the latter explained that his initial assessment of the Broadview scheme suggested that all six turbines would be seen from various points in the village at distances between 2 and 2.5 kilometres from the nearest house. The horizon as seen to the south of the village comprised the top of a broad ridge running east to west which formed the parish boundary. It had been calculated that the top two thirds of the turbines would be seen above this horizon i.e. the whole of the rotating blades. From a viewpoint on the path northwards from the village the fifteen turbines now proposed would dominate the setting of the village, its conservation area, Manor, Church and Ancient Monument in a band between 850 metres and 2500 metres, in an arc pretty well from east to south. The possibility of noise problems was discussed at some length. The Chairman explained that government guidance currently allowed developers to locate even the largest turbines very close to houses. For example, one of the turbines in the scheme would be located no more than 650 metres from a farmhouse in Greatworth parish. A growing body of opinion was suggesting that the current standard was long overdue for review. From the floor it was suggested that an exclusion distance of two kilometres would be more prudent. See here for a map showing the extent of the area within two kilometres of at least one turbine if all fifteen were erected. The local representative of the Campaign for the Protection of Rural England said that Broadview Energy Limited had been given information by a pilot using Turweston Airfield that their proposed windfarm site lay directly below the downwind approach to the airfield circuit for the westerly runway. At this point aircraft are legally entitled to fly at 500 feet and in difficult visibility or bad weather a wind farm in that area would constitute a very serious risk to the air traffic operating at Turweston. The chairman thanked the members of the public for their contributions, received without prejudice to the council’s deliberations when consulted on the actual planning application. He went on to say that Broadview Energy Limited planned to hold a “drop-in” session from 4 pm to 8 pm on Tuesday March 2nd in Marston-St-Lawrence Village Hall where members of the public can learn more about the project and wind power in general, as well as meet and question members of the Broadview team. A press release from the company advertising this event can be seen here. This entry was posted on Friday, February 19th, 2010 at 12:24 pm	and is filed under News. You can follow any responses to this entry through the RSS 2.0 feed. You can leave a response, or trackback from your own site.